It wasn't until I became pregnant in 2012 that we really started attending church every single Sunday. And it wasn't until we really started attending church every single Sunday that we started to follow as much as we could of what Jesus and the Bible taught. Sure, we were good Christians. But being good enough wasn't the answer for us. While we'll never be anything even close to perfect (I will only speak for myself here, but I would say I'm at the opposite end of that particular spectrum), we rely on God and His strength to bring us closer to Him by following what He teaches and advises for us. Part of His teaching is to tithe. Tithing means to be 10% of your income back to the church. If you've ever struggled with budgets and debt, you may be cringing right about now. But I need that 10% to get out of debt, you might say. I need that 10% to make sure I have enough gas in my car to get to work. 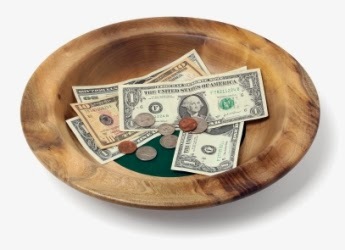 Here's what I can tell you: tithing for an imperfect Christian (yup, that's me) is never easy. Especially when you first begin. You'll find a million and one reasons not to tithe. There will always be something you need. Forget what you want! You're still trying to figure out how to make sure you have everything you need. I hear you. I'm totally with you. I've been there, done that (who am I kidding? I'm there every Sunday morning. I'm still working on the giving freely part). If you're like me, you're thinking, Okay, God. I get it. You say I must do this. But I just can't right now. I love You and You're awesome, but this is my security blanket. You can let go. I promise. It won't be easy. It won't look pretty. But let go and tithe. It may not be enough that God says you must do it. It wasn't for me. Here's what finally got through to me: God gave me 100% of the money we have. The money we have is from God. Yes, we worked for it. But we were able to work because God gave us our brains and our bodies and the ability to work. God isn't asking for all His money back. Oh, no. He's not even asking for half! Just 10%. Still not enough for you? You're a stickler, you are! How about this: if you can't make it on 90%, you're not going to make it on 100% (this will be true for most people). Tithing won't really affect you then. You'll be able to make it less, but only 10% less. If that hasn't convinced you yet that tithing is a fantastic exercise in faith, here's this: once we started tithing in good faith, we were blessed in so many ways. Some in terms of money, others in terms of goods. And others in terms of people just reaching out to us, encouraging us and loving on us. If you don't tithe, God isn't going to stop loving you. He's always going to love you. There's not a thing You can do to make Him stop loving His creation. If you don't tithe, it doesn't mean God won't bless you. You will still have many blessings in Your life! And if you do tithe, it doesn't mean nothing bad will ever happen to you. It doesn't mean you'll see your tithe back in your pockets from blessings given to you by others. That's definitely not what I'm saying. But I am saying that tithing frees up your mind to allow more blessings to come into your lives. You rely on God more which brings you closer to Him. You may find yourself reaching for your Bible multiple times a day to immerse yourself in His promises. You may find yourself praying without ceasing. You may find yourself building new friendships for encouragement and support. Tithing has opened up our lives to a whole new dimension. People have blessed us with food, money, friendship, encouragement and love. Our lives are more full now, even though our wallets are a bit more empty.